MOSCOW, Russia -- Russia is preparing to commemorate the 70th anniversary of the end of World War II, known since the Soviet era as “The Great Patriotic War,” with a series of events, including a massive parade of military hardware and millions of medals handed out to veterans or their relatives. Russian soldier waits on his WWII-era Soviet "T-34" tank ahead of the Victory Day military parade night training, Moscow, April 29, 2015. But critics say the Soviet-style display of power and nationalism overshadows tragic scars during and after the war that still influence politics and fighting in Ukraine. As a young teenager, World War II veteran Ivan Sokolov helped destroy unexploded incendiary bombs dropped on Moscow. He states proudly that victory against Nazi Germany was prepared by Russia. “If it were not for our victory, the map of Europe would have been different,” he says. Critics of the Kremlin say it is now Russia that is redrawing the map of Europe with last year’s annexation of Ukraine’s Crimean peninsula and its ongoing support for separatists fighting in Ukraine’s east. Moscow justified its actions in Ukraine by labeling Kiev’s new leaders as anti-Russian “fascists” and “nazis” — terms that hold emotional weight with many in Russia like veteran Alexander Podobed. “I don't consider all Ukrainians nazis and fascists,” he says. Pro-Russia rebels in Ukraine’s east, and Russians opposed to the western-leaning government in Kiev, have co-opted the Ribbon of St. George, a patriotic symbol of World War II. For the 70th anniversary of “Victory Day” against Nazi Germany, Russia is parading its largest-ever display of military muscle, including new tanks, heavy weapons and some 15,000 troops. Western leaders, including from Germany and wartime allies Britain, France, and the United States, have understandably refused to attend, says Russian historian Andrei Zubov. “Today the government of Russia is an aggressor in Ukraine for over a year,” he says. 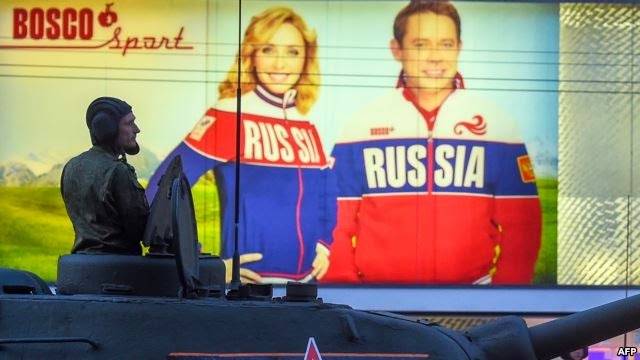 President Vladimir Putin’s Russia revived the Soviet-style parading of military weapons for “Victory Day” in 2008 as part of efforts to harness images of its powerful past. But critics say the nationalist display also distracts the Russian public from the atrocities and tragedies of the Soviet era. As many as 28 million Soviet citizens were killed during the war, but too many of the losses were self-inflicted, notes Zubov. "They were not justified, too high, because of the bad defense organized by Stalin, by the communists,” he says. Zubov, a former professor at the Moscow State Institute of International Relations, was fired last year for comparing Russia's annexation of Crimea with Nazi Germany's annexation of Austria. He says Russia’s present authorities think of themselves as the successors of Soviet power. “After 1945, murders, repression, multiple crimes against the people of Russia continued. I think we must end this triumphant celebration of the victory,” he says. Despite the dark past, many Russians believe Victory Day should not be simply a day of mourning or paying respects but should be celebrated. Scootering with her family in Moscow's Victory Park, sales analyst Natalia Matukhina says Victory Day should be seen as a bright day with bright memories. "You get goosebumps when you watch the Victory Day parade,” she says. “It's Russian might, and it needs to be shown so that everybody understands that we're strong and that we can defend ourselves." Ahead of Victory Day, Russian authorities issued more than two million commemorative medals to veterans and their surviving relatives. But critics note while medals are aplenty, too many veterans lack financial support and good living conditions. Veteran Podobed says the average pension in Moscow is less than $350 a month. “It is very little today,” he says. Meanwhile in Ukraine, Russia's wartime ally is making moves toward a European-style commemoration of World War II. President Petro Poroshenko signed into law a new holiday on May 8, when the West marks Victory in Europe Day, to be a day of remembrance and reconciliation. More controversially, Ukraine's parliament proposed a package of laws against both Nazi and Soviet symbols and giving legal recognition and support to Ukrainian independence fighters who fought against the Red Army.